On May 24, 1958, the first amphibious helicopter produced by Sikorsky Corporation (S-62) was flown. The single turbine-powered engine utilized much of the rotor design and many of the components of earlier models, but it was designed with a watertight fuselage and two outrigger floats which housed retractable landing gear. The helicopter carried up to twelve passengers, and was produced in both military and commercial versions. In fact, it was the first turbine powered helicopter to be certified for commercial use by the FAA. 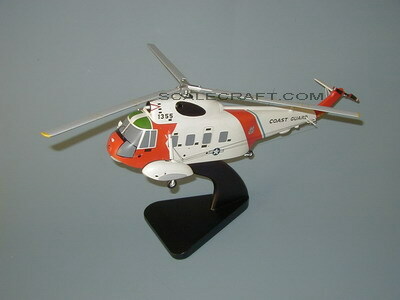 On January 9, 1963 the U.S. Coast Guard received the first of 99 Sikorsky S-62's which were given the designation HH-52A and the name was "Seaguard". The HH-52 was the Coast Guard's first amphibious, turbine-powered helicopter. Due to the Seaguard's ability to land on the water along with it's unique folding rescue platform and overhead winch, the HH-52A has the honor of having rescued more persons than any other helicopter in the world. Mahogany wood. Scale: 1/32. Rotorspan 21 inches, Length 17 inches.